Romantic Waterfront Getaway! Awesome views, pool, hot tub, fishing, and wifi. The Shell Room is a newly remodeled, romantically themed, waterfront studio condo with breathtaking views. Enjoy stunning views of Aransas bay from the windows or relax on the patio with a glass of wine and take in the cooling bay breezes. This cozy studio has a king sized bed, a full sized sleeper sofa, and coastal décor. There is also a dresser, couch, flat screen TV, WIFI, and small table with seating for two. Other amenities include a mini fridge/freezer, microwave, and coffee maker. The bathroom has a tub/shower combo and a hair dryer. All towels and linens will be provided for your comfort, and guests will have access to a community washer/dryer that takes quarters. 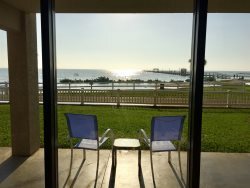 Guests of the Shell Room also get to enjoy the Laguna Reef swimming pool and hot tub that overlook Aransas Bay and the 1000 foot lighted fishing pier. There are also multiple grilling areas, beautiful grounds on the water, and a large parking lot. The Shell Room is located near the Rockport Heritage District and Rockport Beach. Spend a day in the sun at the Rockport Beach where you can rent jet skis, swim with the kids, or grill up some food at one of the picnic areas. The Rockport Beach also allows fishing and is only five dollars for a day pass or 20 dollars for a year pass. There are two piers at the Rockport Beach, the south pier is free and the north pier has a beach admission fee. There is also a boat ramp. We have a list of fishing guides on our site as well. This is also a prime location for birding! Little Bay has many protected areas for birds that you can enjoy while walking along the water. Rockport is home to many historical sights and parks as well, including the Fulton Mansion, Goose Island State Park, and The Texas Maritime Museum. Never run out of things to do and places to see, plan your romantic Rockport vacation today!